Watercolor by Cesare Fracassini (1838-1868),Vatican Museum, signed, inscribed and dated 'Pavesi Copio/1891/C Fracassini/1867'. Measures: sight is 21"high x 15" wide, Overall is 34" high x 28" wide. Cesare Fracassini (or Fracassi) (December 18, 1838 – December 13, 1868) was an Italian painter, mainly of large mythologic or religious topics. 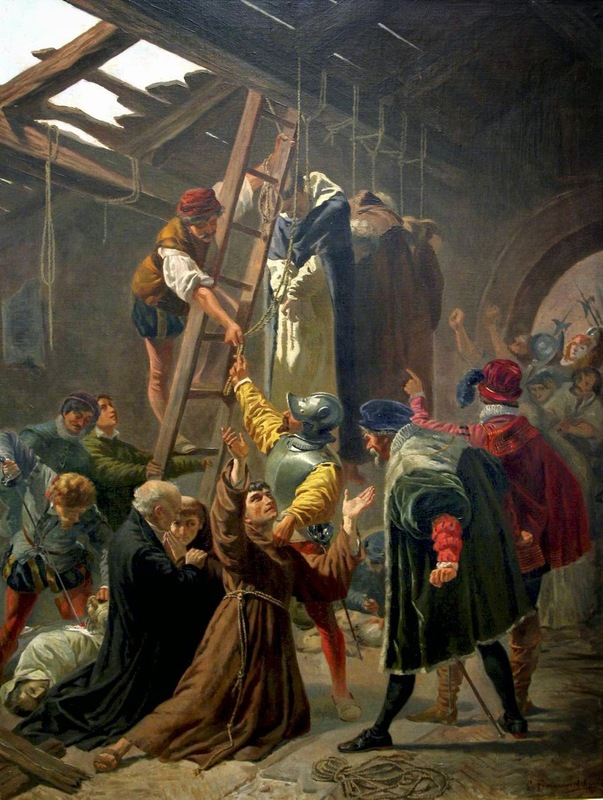 About the Painting: On July 9, 1572, nineteen priests and catholic friars of Gorkum were hanged by the Calvinists in Brielle, Holland. In his work The Martyrs, Dom H. Leclercq tells us: "The nineteen martyrs of Gorkum, canonized on June 29, 1867 by Pope Pius IX, belong to the martyrs of the Netherlands during the wars of religion. The story of his martyrdom was written by a theologian of great merit, William Estius, whose work remains the principal and almost sole source of historical events that were fulfilled in Gorcum and Brielle in 1572. William Estius was the nephew of one of the main martyrs, Nicholas Pieck, the mother of the historian was the martyr's sister. His brother, Rutger Estius, was responsible for compiling all the necessary documents to inform all concerned, and he did so with a concern worthy of the cause that he in his heart served "
The anti-Catholic hatred in the Protestant conception subjected the martyred saints to the prison and derision of the plebs, to physical torture and glorious and exemplary death. They were taken to a monastery called Santa Isabel, a building that had belonged to the Reginal Canons of San Agustín and that was in the process of demolition carried out by the Protestant butchers.